Lightstream vs. SoFi: Which Lender is Best For Good Credit? 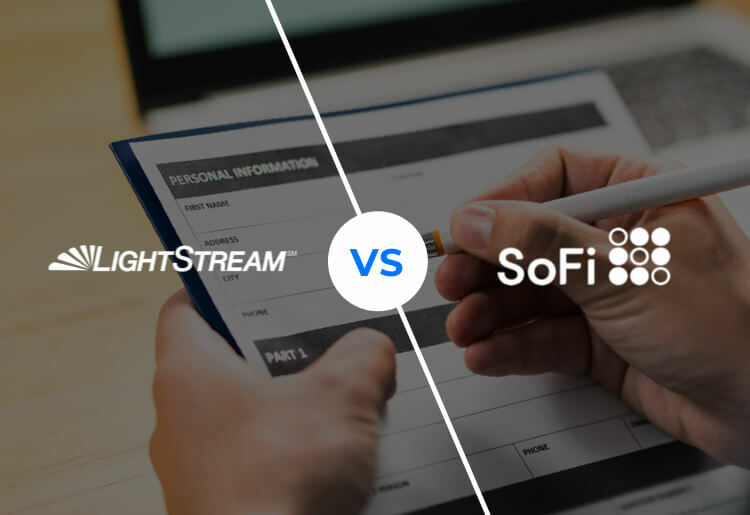 LightStream vs. SoFi: Which Lender is Best If You Have Good Credit? The financial services industry of today is full of companies promising easily approved loans with good rates no matter what your credit’s like. These companies advertise loans for people with credit scores hovering around 500, who don’t have a cosigner or assets to put up for collateral, but need some financial assistance, at least in the short term. But what if you’ve made it this far with your credit score in a little better shape? For people with good credit, online loan companies can provide loans with terms that are often much better than those for people whose credit has taken a beating over the the years. LightStream and SoFi are 2 online lenders that have focused on borrowers with good or better credit, and in this head-to-head battle, we take a look at what makes each one tick. LightStream has made its name in the financial services industry by providing secured and unsecured personal loans of up to $100,000, which is a good bit higher than much of the competition. According to the consumer credit reporting agency Experian, a good credit score is between 670-739. And while LightStream requires its borrowers to have a good credit score, it doesn’t post an ironclad minimum score on its website, rather, it describes a holistic approach taken toward credit. As LightStream states on its site, the company believes “there is no single definition for “good credit,” and lists a series of factors it takes into account, including whether or not the borrower has several years of credit history with a variety of accounts including cards, vehicle loans, and the like, and a good payment history. The company also takes a look at whether or not the person has a proven ability to save money (stocks, bonds, etc) and stable and sufficient income to pay off the debt. After your application is approved, the credit profile you receive from LightStream will determine whether the loan will be unsecured or secured, and how low the rates will be. SoFi has only been in business since 2011, but it hit the ground running with friendly rates on loans of up to $100,000 for people with good credit. This tends to be around 680 on the credit range, but like LightStream, SoFi scans a wider perimeter to determine your credit. It’s part of what the company describes as a way of empowering borrowers to consolidate debt and get a better handle on their financial situation, which is why it offers a number of tools and resources to help users navigate the borrowing and repayment process. One of these is the rather novel “unemployment protection” feature which will freeze your loan payments if you lose your job. LightStream’s loan amounts range from $5,000 to $100,000, meaning that even if you just need a small boost to your bank account, it can get you sorted out. With SoFi, you'll find the same $5,000 to $100,000 range on personal loans, but for student loans, the minimum can depend on which state you reside in. In addition, if you are borrowing for medical resident student loan financing, then your minimum amount will be $10,000 in most states, and as high as $15,000 in Kentucky and Connecticut, and $25,000 in Pennsylvania. Flexibility is a key component whenever you’re considering applying for a loan. The repayment term can have a big effect on whether or not the monthly payment is too large for you to stay on budget each month, and the longer you stretch out the repayment, the more interest you’ll pay by the time the loan is squared away. With SoFi you can receive repayment terms of between 3-10 years for student loans, and variable and fixed rate medical and dental residency refinance loans. For personal loans, SoFi has terms that run from 3-7 years. Chances are that with a range this broad, you should be able to find a repayment schedule that works with your expenses. On LightStream, the terms for personal loans run from 2-12 years. As usual, the longer the term the higher the interest rate, and with 10-12 year loans, the minimum APR hovers around 10%, which can really add up over the lifetime of the loan, even if the flexibility is a positive. With LightStream, the options are limited to secured and unsecured personal loans, but the company doesn’t enforce any requirements about how you use the money once you receive it. SoFi’s loan options are more numerous, spanning from secured and unsecured personal loans to student loan refinancing, medical/dental resident refinancing, personal loans, and parent PLUS refinancing, as well as mortgages. The terms vary somewhat between the various types of loans. Sites like Sofi and LightStream make taking a loan about as easy as can be, but there may still be times when you need help. If you’re using SoFi, you can first try to find answers in the FAQ section before turning to the company directly. SoFi also has 3 toll-free numbers you can call for support, as well as a Twitter account that the company encourages users to contact with questions. In addition, you can fill out an online customer service form and the company will reply with an answer to your query. LightStream has fewer options for customer service. The company has a searchable FAQ section which is very informative and easy to use, and an online form you can fill out for help. Neither site offers a live 24/7 customer service chat option. The terms you get with a loan will always depend to some extent on your credit score, the collateral you put up (with a secured loan), the length of your loan, and the amount you take out. Regardless, both companies advertise average loan APRs, which should give you a pretty good gauge of how your loan will play out. SoFi advertises average APRs from 6.54% - 15.49% and the better credit you have, the more likely you are to receive rates on the lower end of the scale. Lightstream advertises average APRs from 5.74% - 16.99%, and the same is true when it comes to your credit score. Sometimes it can be the little differences that set one lender apart from another. SoFi has long had the approach of trying to make financial services less beguiling for people like college graduates and young professionals who may have little prior experience dealing with banks. This can be reflected partly in the company’s “unemployment protection” feature, which will temporarily freeze your payments if you lose your job. SoFI is also very focused on providing a personal approach and through its SoFi community scheme it organizes social events, encourages networking and brings young borrowers together through social media. LightStream has an interesting feature that will also appeal to borrowers who may be new at this, and perhaps are a bit concerned that they’re not getting the best deal out there. Called the “rate beat program,” this feature offers to beat any APR presented by another leader by 0.10 percentage points. In addition, the company promises to send you $100 if you aren’t completely satisfied with the loan. Both LightStream and SoFi are solid lending options for borrowers who have good credit and would like to take out a loan with reasonable terms. LightStream only offers personal loans, so SoFi would probably be a better option if you need a medical or dental resident loan or a student loan, or other types of loans that aren’t offered by LightStream. LightStream on the other hand, offers longer repayment terms on personal loans, so it may be a better choice if you’re set on taking out a personal loan and you need the longest repayment term. Both companies have the same minimum and maximum loan amount, and could do better on customer service, though SoFi does have more options in this regard. SoFi’s unemployment protection feature makes the company a better choice if you’re somewhat concerned about your job stability and don’t want to risk going further into debt. Simply put, both companies have their pluses and minuses, but if you have good credit and you’d like to borrow up to $100,000 both LightStream and SoFi can sort you out.